The Tangier American Legation (including the Paul Bowles Wing) is open Monday―Friday from 10 AM to 1 PM and from 3 PM to 5 PM. 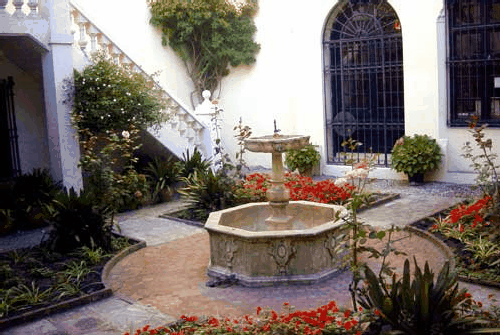 The Tangier American Legation Institute for Moroccan Studies (T.A.L.I.M.) is located in the medina of Tangier, Morocco. It is a museum, library, and a research and cultural center that specializes in North African and Arabic language studies. The Paul Bowles Wing has three entire rooms. The Tangier American Legation is open Monday through Friday, from 10 AM to 1 PM, and from 3 PM to 5 PM. There is no charge for admission. This historic property―a gift from Sultan Moulay Suliman to the United States of America in 1821―is the oldest American diplomatic property in the world, and the only property on foreign soil which is listed in the National Register of Historic Places. 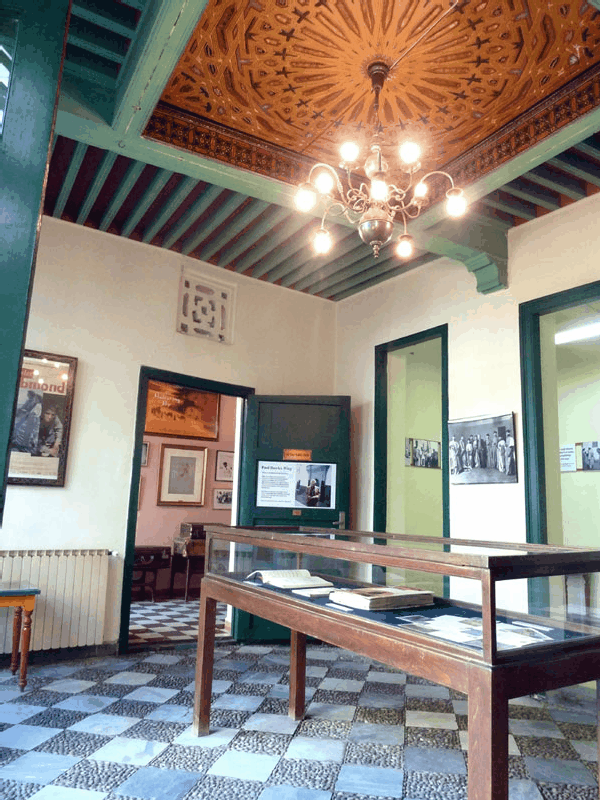 Don't forget to visit this museum during your visit or stay in Tangier. Please note that the Paul Bowles Wing is devoted to the writer, composer, translator and musicologist Paul Bowles, who was not a "Beat" writer. In 2010, the year marking the centenary of Paul Bowles’ birth, the Moroccan music that Paul Bowles recorded fifty years ago for the U.S. Library of Congress in Washington―the Paul Bowles Moroccan Music Collection―was repatriated to Morocco and is in the process of being digitized and will soon be available for all in the Paul Bowles Wing of the Tangier American Legation. This digitization was made possible by a grant from the U.S. Embassy in Rabat, Public Affairs Office, with additional funds raised by the Wilaya de Tanger and Royaume du Maroc, Ministère de la Culture. 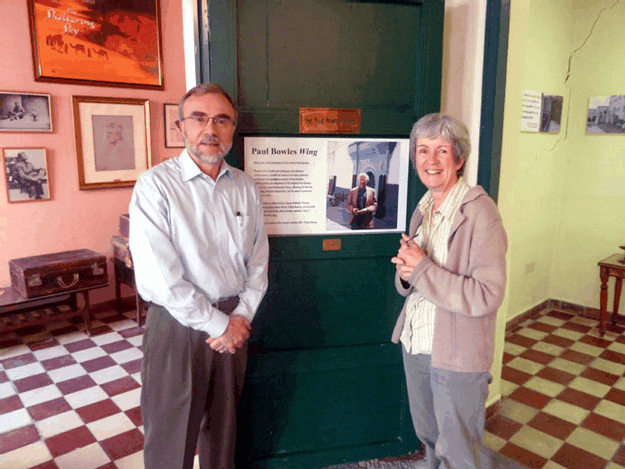 Gerald Loftus, the director of the Tangier American Legation Institute for Moroccan Studies (TALIM) and wife Marie Hélène, stand by a door in the Paul Bowles Wing, inaugurated in October 2010 during the Bowles Centennial celebrations in Tangier. 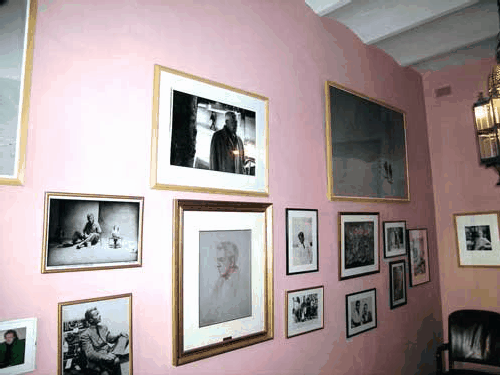 The Paul Bowles Wing was established in October 2010 during the Paul Bowles Centennial celebrations in Tangier. 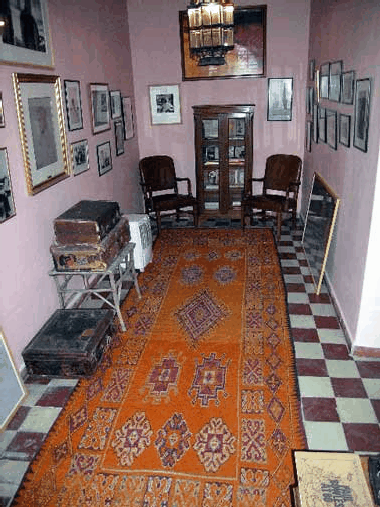 The original smaller room was the inspiration of Gloria Kirby, a resident of Tangier, who established the exposition through her donation of books, furnishings, photographs, and other memorabilia relating to the life of Tangier’s most famous expatriate writer and composer. As a work-in-progress, the Paul Bowles Wing continues to evolve with contributions from other individuals. Display cabinets hold books and other items related to Paul Bowles. (Photograph © 2010 by Cherie Nutting). 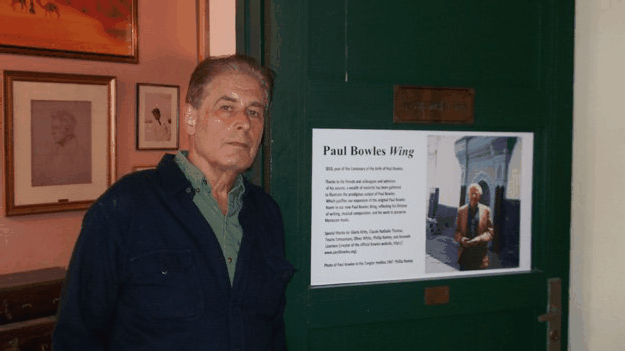 American composer Phillip Ramey, a close friend and longtime neighbor of Paul Bowles in Tanger, visits the Paul Bowles Wing in July 2011. The photo of Bowles on the poster was taken by Ramey in the Tangier medina in 1987. 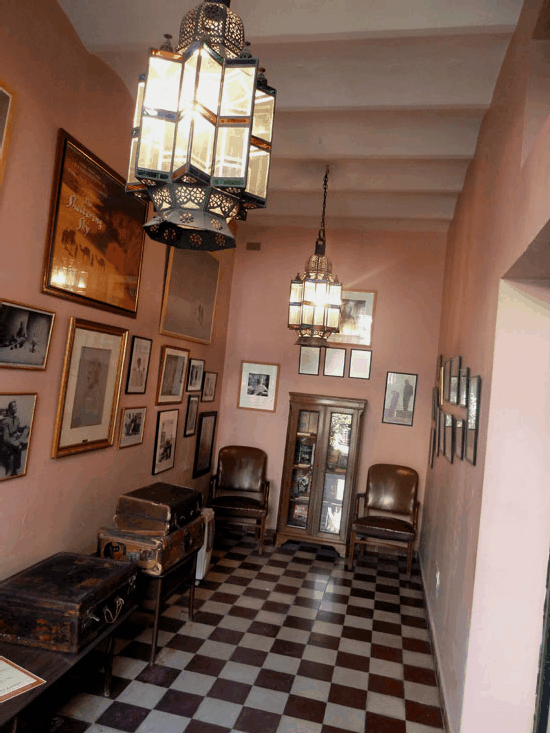 On permanent display in the Paul Bowles Wing are a wide range of items related to Paul Bowles: books, photographs, letters, music scores, suitcases and other memorabilia depicting Paul Bowles' life throughout his more than half-century in Tangier. 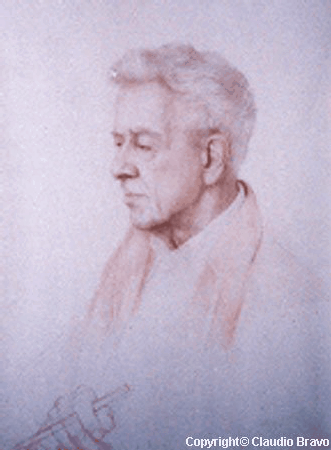 A copy of the portrait of Paul Bowles by the celebrated Chilean-born artist Claudio Bravo is also on display in the Paul Bowles Wing. 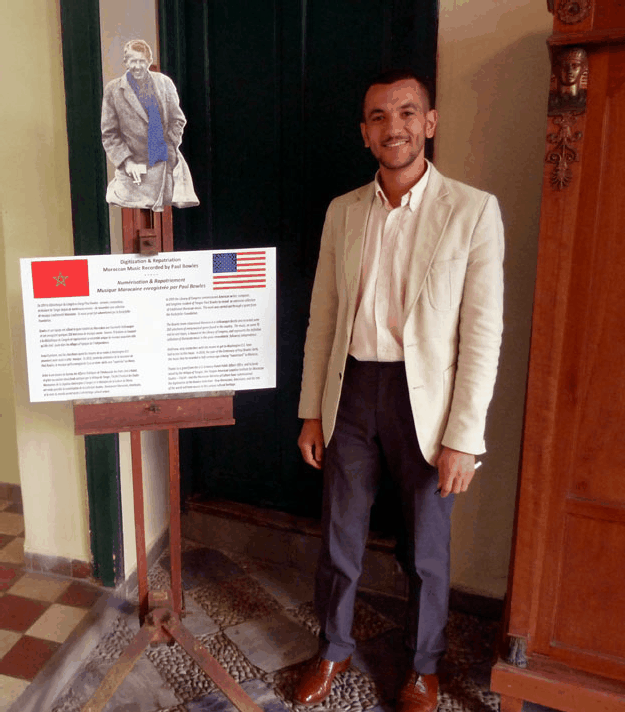 Mohammed Jadidi, a curator at the Tangier American Legation, speaks fluent English, French, Spanish and Arabic, and he will provide information about the Legation and the Paul Bowles Wing. Books by and about Paul Bowles and Tangier are also available for purchase in TALIM's bookshop. An interior view of the smaller room. The Moroccan Chiadma rug is a gift from W. Russell Pickering and Brooke Pickering, notable experts on oriental and Moroccan carpets. Other donated and acquired items on exhibition are books, letters, scores, music, recordings, Jane Bowles's telephone and several of Paul Bowles's many suitcases. 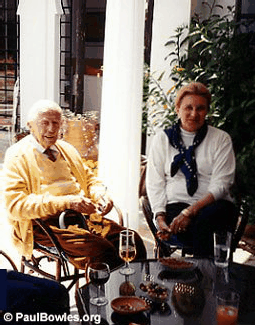 Gloria Kirby with Paul Bowles on a terrace at her Tangier villa. Tangier, Morocco links On the bottom half of that page there are listings of links to Web sites for cultural activities, art galleries, Moroccan media, airlines, current weather and time, ferry boats and hydrofoil services, hotels and guesthouses, and general travel information for both Tangier and Morocco.